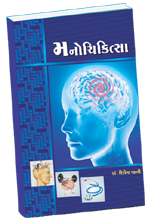 This book is a collection of an various articles published in Gujarati News Paper "Divya Bhaskar" and "Saurashtra Samachar". It involves topics like Depression, Anxiety, Schizophrenia, OCD, Mania, Sexual Health, Somatoform Diasorders etc. Price of Book - Rs.50/- only + Rs.40/- Postage Charge extra. - To purchase this book, please send cheque or money order or demand draft on name of "MANOCHIKITSA" at below mention address. NOTE: Please clearly mention your full name, address and contact no in money order slip.